Hugo van der Goes (probably Ghent c. 1430/1440 – Auderghem 1482) was one of the most significant and original Flemish painters of the late 15th century. Van der Goes was an important painter of altarpieces as well as portraits. He introduced important innovations in painting through his monumental style, use of a specific colour range and individualistic manner of portraiture. The presence of his masterpiece, the Portinari Triptych in Florence, from 1483 onwards played a role in the development of realism and the use of colour in Italian Renaissance art. Hugo van der Goes was likely born in Ghent or in the vicinity of Ghent around the year 1440. Nothing is known with certainty about the artist's life prior to 1467, the year in which he became a master in the painters' guild of Ghent. The sponsors for his membership of the guild were Joos van Wassenhove, master painter in Ghent from 1464, and Daneel Ruthaert. It is likely that he had trained elsewhere before he became a master in Ghent. Some historians have suggested that Dieric Bouts was possibly the master of van der Goes but there is no independent evidence for this. In 1468 the artist was commissioned by the city of Ghent to execute some works in connection with the grant of the Great Indulgence of the city. More commissions from the city in the following years required van der Goes to create decorations for events such as papal blazons. In 1468 he was in the town of Bruges making decorations to celebrate the marriage between Charles the Bold and Margaret of York. Hugo van der Goes is recorded again on 18 October 1468 when he and other members of Ghent's painter's guild hosted painters from nearby Tournai at the guild's assembly in Ghent to celebrate St. Luke's day together. St. Luke was the patron saint of painters. 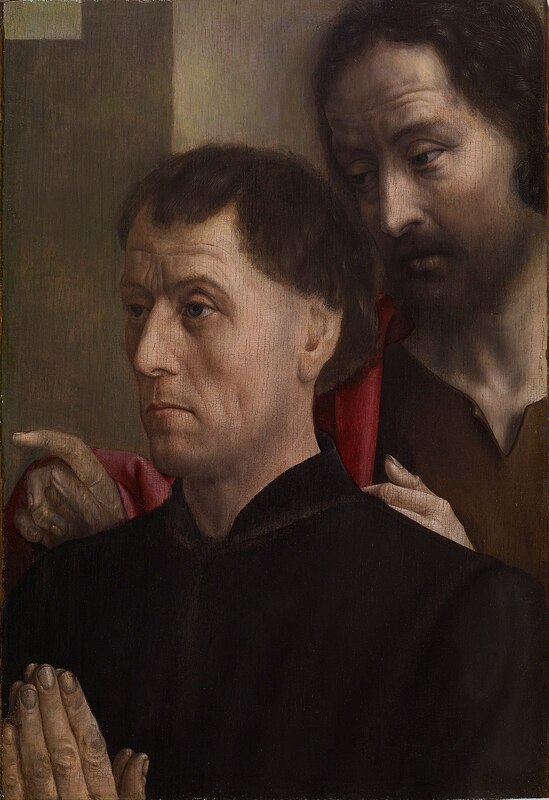 In 1469 Hugo van der Goes and Joos van Wassenhove vouched for Alexander Bening for his entry as a master in the painter's guild of Ghent. Alexander Bening married Catherina van der Goes, a cousin of Hugo van der Goes, in 1480. The artist and his workshop worked on commissions of the city of Ghent to provide heraldic decorations for Charles the Bold's Joyous Entry in Ghent in 1469 and later in 1472. When in 1470 Joos van Wassenhove left Ghent for Italy to become the court painter of Federico da Montefeltro, the Duke of Urbino, van der Goes became the leading painter in Ghent. In 1473 the Burgundian court paid van der Goes for creating the blazons used at Charles the Good's funeral. The painter was repeatedly elected as deacon of the painter's guild of Ghent and served as its deacon from 1474 to 1476. It was during this period that Hugo van der Goes painted the Adoration of the Magi (also known as the Monforte Altarpiece (Gemäldegalerie, Berlin)) and worked on the commission of Tommaso Portinari for the Portinari Altarpiece (Uffizi, Florence), which arrived at its destination in Florence only in 1483, when the artist had already died. Van der Goes achieved considerable success and secured important commissions from the Burgundian court, church institutions, affluent Flemish bourgeoisie and associations of Italian business people based in the Burgundian Netherlands. When he had reached the peak of his career in 1477 van der Goes suddenly decided to close down his workshop in Ghent to become a frater conversus (i.e. a lay brother) at the monastic community of the Rood Klooster (or Rooklooster) near Auderghem (now in Brussels). The Rood Klooster was part of the monastic wing of the Modern Devotion movement and belonged to the Windesheim Congregation. At the monastery he enjoyed certain privileges. He was allowed to continue working on painting commissions and to drink wine. According to the chronicle written up in Latin some time between 1509-1513 by Gaspar Ofhuys, a fellow monk in the Rood Klooster, van der Goes received visits by eminent persons including Archduke Maximillian. During his time at the cloister he received in 1482 a request from the counsel of the City of Leuven to value the works for the Leuven city hall that Dieric Bouts had left unfinished at the time of his death. As a reward for this service van der Goes received a jug of Rhine wine from the city authorities. It is believed that it was van der Goes who completed Bouts' unfinished Triptych for Hyppolite Berthoz. His contribution was the painting on the left panel of the portraits of the couple who had paid for the tryptych. In 1482 the monastery sent van der Goes to Cologne together with his half-brother Nicolaes, who had also taken religious vows, and another brother of the monastery. On the return leg of this trip the artist suffered an acute depression and declared himself to be damned. He made an unsuccessful suicide attempt. His companions brought him back to Brussels and then to the Rood Klooster. After a brief recovery, he died not long thereafter in the Rood Klooster. There is speculation that anxiety about his artistic achievements may have contributed to his madness, for 'he was deeply troubled by the thought of how he would ever finish the works of art he had to paint, and it was said then that nine years would scarcely suffice'. A report by a German physician, Hieronymus Münzer, from 1495, according to which a painter from Ghent was driven to melancholy by the attempt to equal the Ghent Altarpiece, may refer to Hugo van der Goes. The mental breakdown of Hugo van der Goes was only rediscovered in 1863, when the Belgian historian Alphonse Wauters published the information, which he had found in Ofhuys' newly discovered chronicle. Wauters' publication inspired the late Romantic Belgian painter Emile Wauters (a nephew of Alphonse Wauters) to create his 1872 painting Portrait of Hugo van der Goes (1872, Royal Museums of Fine Arts of Belgium). This painting depicts Hugo van der Goes during his period of madness and was so successful that it was awarded a Grand Medal at the Paris salon. In 1873 the Dutch painter Vincent van Gogh mentioned Wauters' painting in a letter to his brother Theo van Gogh. On two further occasions van Gogh likened his own appearance to that of van der Goes as recreated by Wauters, and stated that he identified emotionally with the 15th-century painter. Attribution of his work has been difficult for art historians. Many works, which in the early to mid 20th century were believed to be by his hand, are now accepted to be copies by members of his workshop or by followers. In the absence of documentary evidence, attributions have been based on a comparison with his 1470 Portinari Altarpiece (Uffizi, Florence) for which there exists a clear attribution of authorship by van der Goes. The originals of a large portion of van der Goes's works have been lost. These works only survive through later copies made after these now lost originals. The large number of copies bears witness to the high regard in which he was held and also contributed to his important influence on early Flemish art. Martin Schongauer's prints after van der Goes' works spread the artist's influence across the Flemish borders into Germany. The prominent Bruges painter Gerard David and the assistants in his workshop clearly took their inspiration from the Ghent artist. Hugo van der Goes was an important painter of altarpieces as well as portraits. His principal religious works include the Portinari Triptych (Uffizi, Florence), the Adoration of the Magi (also called the 'Monforte Altarpiece'), the Adoration of the Shepherds (both Gemäldegalerie, Berlin), the Fall and Redemption of Man (Kunsthistorisches Museum) and the Death of the Virgin (Groeningemuseum, Bruges). In the 1460s, van der Goes was commissioned to provide an altarpiece for the Church of the Holy Trinity in Edinburgh by its first provost, Edward Bonkil. The church had been founded by Scotland's queen consort, Mary of Guelders. The four surviving panels of the Trinity Altarpiece depict James III, King of Scots, flanked by St. Andrew and his son, the future James IV, and his wife, Margaret of Denmark. The donor, Edward Bonkil, also features. Van der Goes' most famous surviving work is the Portinari Triptych (Uffizi, Florence). The Triptych is an altarpiece commissioned for the church of San Egidio in the hospital of Santa Maria Nuova in Florence by Tommaso Portinari, the manager of the Bruges branch of the Medici Bank. In 1483, apparently some years after its completion by van der Goes, the Portinari Altarpiece arrived in Pisa from which it was shipped via canal to the Porta San Friano in Florence. The altarpiece was hung in the church of the hospital of Santa Maria Nuova. The raw features of the shepherds in van der Goes' composition made a deep impression on painters working in Florence. Domenico Ghirlandaio likely drew inspiration from the Portinari Triptych for his Epiphany in the Sasseti chapel. The largest Netherlandish work that could be seen in Florence, it was greatly praised. In his Vite of 1550 Giorgio Vasari referred to it as by "Ugo d'Anversa" ("Hugo of Antwerp"). This is the sole documentation for its authorship by Hugo van der Goes. All other works are attributed to van der Goes based on stylistic comparison with the altarpiece. After Hugo van der Goes' death the triptych was wrongly attributed to others, including Andrea del Castagno and Domenico Veneziano. These two artists had produced the frescoes around the altarpiece, but were not involved in its design. In 1824, Karl Friedrich Schinkel identified it as the work of Hugo van der Goes. It was not until later that this theory became generally accepted. The central panel of the Portinari Triptych depicts the central Christian myths concerning the birth of the Christian saviour god: the nativity of Jesus, the adoration of the shepherds and the annunciation to the shepherds (in the far right background). Many interpretations of the iconography of the altarpiece have been proposed. The composition emphasizes the devotion to the Eucharist and the passion of Christ. The Eucharist is represented through the angels wearing liturgical vestments and the visual analogy of the sheaf of wheat with the body of Christ. The Passion is represented in the somber expressions of the figures and in the prominently placed flower still life in the foreground, which includes flowers such as a scarlet lily, white and purple irises and carnations. One of the containers in which the flowers are placed is of the albarello type. Albarelli were used as medicinal jars designed to hold apothecaries' ointments and dry drugs and thus reference in the picture the hospital setting (i.e. the hospital of Santa Maria Nuova) in which the altarpiece was to be displayed. Some of the flowers in the flower still life were in the Renaissance also used for medicinal purposes and thus also reference the hospital setting. These references to medicinal powers also allude to the miraculous birth of Jesus, which, according to Christian literature, happened without the usual birth pains. The birth of Jesus itself is also supposed to have healing powers by delivering mankind from the so-called original sin, the Christian doctrine of humanity's state of sin, which resulted from the fall of man. The side panels depict the male (left wing) and female (right wing) members of the Portinari donor family who commissioned and donated the altarpiece. The right wing also includes a scene of the annunciation to the Magi and the left wing a scene of the journey of Mary and Joseph to Bethlehem. No independent portraits by Hugo van der Goes have survived. His achievements in this genre are only known by the donor portraits included in his devotional diptychs and triptychs. Examples are the left wing of the Saint Hippolytus Altarpiece, the central and right panels of which are by Dieric Bouts (c. 1475, Groeningemuseum, Bruges), the Portinari Alarpiece, the Trinity Altarpiece (between 1473 and 1478, Scottish National Gallery, Edinburgh) and the fragments of altarpieces such as the Portrait of a Man at Prayer with St John the Baptist (Walters Art Museum) and the Portrait of a Man. The portraits included in these devotional works typically depicted a man or woman in prayer, who appear to be experiencing some vision, often of the Virgin Mary. The Portrait of a Man (c. 1575, Metropolitan Museum of Art, New York) is a good example of his portrait work. This small panel was cut down to its current oval shape from its original rectangular format. It formed likely the right wing of a small altarpiece known as a diptych, which is only made up of two panels. Alternatively, a portrait of the sitter's wife may have been painted on a panel on the right of a central panel depicting a Christian scene, so that as a whole the artwork formed a conventional triptych. The Christian scene was likely a depiction of the Virgin and Child. In the Portrait of a Man van der Goes demonstrated his skills as a portrait painter through his ability to bring out the sitter's resolute bearing and strength of character. He achieved these effects by placing the sitter on a higher level than the viewer and by creating a contrast between the face that catches the light from outside and the dark wall behind it. Van Goes used chiaroscuro effects to further accentuate the modeling of the facial features, which appear to be made of stone. These features as well as the appearance of the hands and background after they were painted over by later restorers may explain why scholars previously attributed this male portrait to the Italian painter Antonello da Messina. The stark realism of Hugo van der Goes' approach, with its meticulous rendering of the dark tones in the man's face, the stubble on his chin and his rough hands joined in prayer, creates the impression that the sitter of the portrait was gripped by a strong feeling of devotion. The donor portrait of Hippolyte de Bertohoz on the left wing of the Saint Hippolytus Altarpiece and Edward Bonkil's head painted on the right wing of the Trinity Altarpiece show a similar realism in the treatment of portraits by van Der Goes. The Portrait of a Man at Prayer with Saint John the Baptist (Walters Art Museum) shows similar traits. As at the time the display of strong emotion in public was frowned upon, Hugo van der Goes resorted in this work to the most subtle facial expressions to express his sitters' mental state. In the Portrait of a Man at Prayer with Saint John the Baptist the deep concentration of the sitter is suggested in a subtle manner in the raised eyebrow and tense muscles around his mouth. Van der Goes is regarded as one of the most original and innovative early Netherlandish artists. As many works of van der Goes have not survived and most of the surviving works cannot be dated accurately, it is difficult to establish a stylistic development for van der Goes. The Portinari Altarpiece is the sole of his works that can be confidently linked to the artist. Even so, art historians see a global development starting with a style close to the illusionism of van Eyck. This early style was characterised by a detailed description in rich colour and a single vanishing-point perspective as can be observed in the Monforte Altarpiece and Portinari central panel. Van der Goes may have learnt this style from Petrus Christus or Dieric Bouts. Later works gradually abandoned illusionism for an increased emphasis on the artificiality of the picture as created image, divorced from reality. This effect was achieved by the use of a limited range of colours and the expressive distortion of figures as well as space. Example of works in this later style are the Death of the Virgin (Groeningemuseum, Bruges) and the Adoration of the Shepherds (c. 1480, Gemäldegalerie, Berlin). Other characteristics imputed to these later works are a breakdown of space, a renunciation of still-life elements not directly related to the subject matter and an exaggerated agitation and an excess of expression in the figures. Early scholars saw the evolution as a reflection of the increasing mental instability of the artist. Later interpretations gave much weight to the artist's adherence to the Modern Devotion movement as an important influence. These interpretations see the later paintings as attempts by van der Goes to translate the ideas of this movement into a visual medium. In particular the movement's emphasis on meditation is seen as playing a key role in the artist abandoning illusionism. The muted coloring of the late Adoration of the Shepherds seemed to support the interpretation of a stylistic evolution away from illusionism. A recent restoration of the Adoration has provided new visual evidence, which contradicts the earlier reading as it revealed that rather than muted the painting was bright and strongly illusionistic. Not all scholars agree there was a stylistic development in van der Goes' work. Some insist that his career of only 15 years was too short to allow for a development to be distinguished. Other scholars regard van der Goes as an artist with an ability to create in the same period and even within a single composition very different types and styles of work. They maintain that van der Goes had the flexibility and range to use or discard techniques whenever they suited his purpose. Hugo van der Goes left a large number of drawings. These drawings or the paintings themselves were used by followers to produce large numbers of copies of compositions from his own hand that are now lost. After van der Goes' death, the book illustrator Alexander Bening, who was married to a niece of van der Goes, likely came in the possession of van der Goes' drawings and patterns. Simon Bening, the son of Alexander Bening, is believed to have introduced these drawings in Bruges later on since compositions by van der Goes appear in an illustrated book of hours created by the Ghent-Bruges school of illuminators. A drawing of Jacob and Rachel preserved at the Christ Church Picture Gallery, Oxford is thought to be a rare surviving autograph drawing by van der Goes. It was possibly a preliminary study for a stained glass window. ^ a b c Koster, Margaret (1999). Hugo van der Goes's "Portinari Altarpiece": Northern invention and Florentine reception. Columbia University. ^ Campbell, Lorne. The Fifteenth-Century Netherlandish Paintings. London, National Gallery. New Haven: Yale University Press, 1998. ISBN 0-300-07701-7, p. 240. Adoration of the Shepherds is a late oil painting by Hugo van der Goes, now in the Gemäldegalerie, Berlin. Unusually large for the painter, it is less well-known than his Portinari Triptych or his Monforte Altarpiece on the same subject. He produced it before renouncing his worldly life and becoming a lay brother at Rouge-Cloître Abbey near Brussels, a daughter house of the Windesheim Congregation in the strict tradition of the Brethren of the Common Life, part of the wider devotio moderna movement. Alexander Bening (died 1519), also Sanders Bening, was an early 16th-century miniature painter of the Ghent-Bruges school and Netherlandish tradition. His date of birth is unknown. Bening was part of a South Netherlandish family of illuminators. He married Kathelijn van der Goes (probably a sister or niece of the painter Hugo van der Goes). Bening had two sons: Simon Bening, who was trained in his father's craft, and Paul Bening, whose profession is unknown. It has been suggested that Bening himself was Scottish, and was related to the artists working in Edinburgh during the sixteenth century. His daughter Cornelia married Andrew Halyburton, Conservator of Scottish privileges in the Netherlands, which may or may not confirm a Scottish connexion.No documented work is known by Bening. Records indicate in 1469 he became a member of the Guild of Saint Luke. Sanders and his family lived in Ghent, but in 1486 he also joined the Bruges Guild of St John and St Luke, whose membership embraced all those concerned with the production of books. Christ Church Picture Gallery is an art museum at Christ Church, one of the colleges of Oxford University in England. The gallery holds an important collection of about 300 Old Master paintings and nearly 2,000 drawings. It is one of the most important private collections in the United Kingdom. The greater part of the collection was bequeathed by a former member of the college, General John Guise, arriving after his death in 1765. Further gifts and bequests were made by W. T. H. Fox-Strangways, Walter Savage Landor, Sir Richard Nosworthy & C.R. Patterson (Russian Orthodox metal plaques, many enamelled). The Picture Gallery is especially strong on Italian art from the 14th to 18th centuries. The collection includes paintings by Annibale Carracci (The Butcher's Shop), Duccio, Fra Angelico, Hugo van der Goes, Giovanni di Paolo, Filippino Lippi (The Wounded Centaur), Sano di Pietro, Frans Hals, Salvator Rosa, Tintoretto, Anthony van Dyck and Paolo Veronese, and drawings by Leonardo da Vinci, Raphael, Michelangelo, Albrecht Dürer and Peter Paul Rubens and a great range of other artists, especially Italians.The drawings collection is shown by a small exhibition, changing roughly every three months, and sometimes showing works not in the permanent collection, especially those by modern artists. The gallery was designed by Hidalgo Moya and Philip Powell, and built in 1968, enabling the collection to be open to the public for the first time. It is located in the Deanery garden.Professor Joanna Woodall of the Courtauld Institute is a former Assistant Curator of the gallery. The current (2015) curator is Jacqueline Thalmann. The Death of the Virgin Mary is a common subject in Western Christian art, the equivalent of the Dormition of the Theotokos in Eastern Orthodox art. This depiction became less common as the doctrine of the Assumption gained support in the Roman Catholic Church from the Late Middle Ages onward. Although that doctrine avoids stating whether Mary was alive or dead when she was bodily taken up to Heaven, she is normally shown in art as alive. Nothing is said in the Bible about the end of Mary's life, but a tradition dating back to at least the 5th century says the twelve Apostles were miraculously assembled from their far-flung missionary activity to be present at the death, and that is the scene normally depicted, with the apostles gathered round the bed.A virtuoso engraving by Martin Schongauer of about 1470 shows the Virgin from the foot of a large bed with the apostles spread around the three sides, and this composition influences many later depictions. Earlier depictions usually follow the standard Byzantine image, with the Virgin lying on a bed or sarcophagus across the front of the picture space, with Christ usually standing above her on the far side, and the apostles and others gathered around. Often Christ holds a small figure that may look like a baby, representing Mary's soul. A prominent, and late, example of the subject is Death of the Virgin by Caravaggio (1606), the last major Catholic depiction. Other examples include Death of the Virgin by Andrea Mantegna and Death of the Virgin by Hugo van der Goes. All these show the gathering of the apostles around the deathbed, as does an etching by Rembrandt. Three minor anonymous artists are known to art history as the Master of the Death of the Virgin. The Death of the Virgin is an oil on oak panel by the Flemish painter Hugo van der Goes. Completed c 1472–80, it shows the Virgin Mary on her deathbed surrounded by the Twelve Apostles. The scene is borrowed from Jacobus de Voragine's thirteenth-century "Legenda aurea" which relates how the apostles were brought, at Mary's request, on clouds by angels to a house near Mount Zion to be with her in her final three days. On the third day Jesus appeared above her bed in a halo of light surrounded by angels to accept her soul at the point when his name was finally mentioned. Three days later he reappeared to accept her body. Early Netherlandish Painting (German: Die altniederländische Malerei) is a pioneering 14-volume series of illustrated books by the German art historian Max Jakob Friedländer (1867–1958). The first volume was published in 1924, and the series ran until 1937. It was the first comprehensive modern art-historical survey of Early Netherlandish painting, a term often used in art history to describe artists of the Low Countries during the 15th- and 16th-century Northern Renaissance. Friedländer developed an interest in northern art of the period while director of the Kaiser-Friedrich-Museum in the late 1920s and early 1930s. The collection included a large selection of Flemish paintings, including Jan van Eyck's Madonna in the Church, Rogier van der Weyden's Miraflores Altarpiece and Altar of Saint John, and Hugo van der Goes' Adoration of the Maji. Friedländer was struck by the lack of biographical detail on even the most accomplished of the artists, some of whom were still identified by notnames, the sometimes poorly supported attributions, and general historical neglect.The book focuses on establishing biographical details for the painters, attributing individual works, and detailing their major stylistic themes and techniques. The undertaking was extremely difficult, given the scant historical record of even the most significant artists.The series was a major influence on Erwin Panofsky's equally seminal Early Netherlandish Painting, which expanded on Friedländer's biographical and stylistic analysis to focus on iconography, intended meaning and historical context. The following is an incomplete list of paintings and drawings by the Early Netherlandish painter Hugo van der Goes. Attribution of his work has been difficult for art historians, and a great many works though, in the early to mid 20th century, to be by his hand are now accepted to be copies by members of his workshop or by followers. Often, when trying to establish attribution, if there was no documentary evidence, comparisons were made to his great 1470 Portinari Altarpiece, mentioned by Vasari.Hugo appears to have left a large number of drawings, and either from these or the paintings themselves followers made large numbers of copies of compositions that have not survived from his own hand. The Master of 1499, sometimes called the Bruges Master of 1499, was a Flemish painter active at the end of the fifteenth century, known from four paintings, all closely related to earlier works by others, and one dated "1499". It appears likely that he was from Ghent and not from Bruges, his name notwithstanding. He copied the style of Hugo van der Goes, and his name is derived from a diptych he painted for Christian de Hondt, dated to 1499 and preserved in Antwerp, in the Koninklijk Museum voor Schone Kunsten; in this painting he copies the work of Jan van Eyck. His output also includes a Madonna and Child with Four Saints, now in Richmond, Virginia; a Coronation of the Virgin in the Royal Collection; a diptych of the Annunciation in Berlin; and a Holy Family with Angels in Antwerp. The Master of the Khanenko Adoration was a Flemish painter active at the end of the fifteenth century. His style is influenced by those of Hugo van der Goes, Hans Memling, and Robert Campin; additionally, echoes of the work of Joachim Patinir and Gerard David may be seen in some of his paintings. His name is derived from an Adoration of the Magi, now in the Museum of Western and Oriental Art in Kiev, that once belonged to the Khanenko collection. Also ascribed to him are a Madonna and Child in Stuttgart and an Adoration of the Magi in Saint-Omer, although both attributions have been disputed. The Monforte Altarpiece (c. 1470) is an oil on oak panel painting of the Adoration of the Magi by the Flemish painter Hugo van der Goes, now in the Gemäldegalerie, Berlin, Germany. The altarpiece was originally the central panel of a triptych with movable wings that are now lost; these were probably painted on both sides. This is shown by the hinges remaining in the original frame. Old copies of the work show the Nativity and Circumcision of Jesus on the wing panels. The central panel has been reduced in size at the top. The Nativity at Night or Night Nativity is an Early Netherlandish painting of about 1490 by Geertgen tot Sint Jans in the National Gallery, London (NG 4081). It is a panel painting in oil on oak, measuring 34 × 25.3 cm., though it has been cut down in size on all four sides. The painting shows the Nativity of Jesus, attended by angels, and with the Annunciation to the shepherds on the hillside behind seen through the window in the centre of the painting. It is a small painting presumably made for private devotional use, and Geertgen's version, with significant changes, of a lost work by Hugo van der Goes of about 1470. In art history, a Notname (German: [ˈnoːtˌnaːmə] (listen), "necessity-name" or "contingency-name") is an invented name given to an artist whose identity has been lost. The practice arose from the need to give such artists and their typically untitled, or generically titled works, an acceptable if unsatisfactory grouping, avoiding confusion when cataloging. The phrases provisional name, name of convenience and emergency names are sometimes used to describe anonymous masters; nonce name was at one time used. The practice of using generic names for unidentified artists is most common in the study of art of the antiquity, especially of the Roman era or with artists of the Northern Renaissance until about 1430. Typically a pseudonym is applied after commonality is established for a grouping of works, of which a similarity of theme, style, iconography, biblical source or physical location can probably be attributed to one individual or workshop, but because of lack of surviving documentary record, the name of that individual is lost. Groupings of works under a given notname can often be contentious; in specific cases art historians have argued that the reality may be a group or school of artists working under a common influence or commercial demand. Linking a generically titled old master with a historical person is usually a tempting and exciting prospect, and would establish an art historian's reputation. The given notname usually depends on the artist's location, the most distinctive feature of their work, or the theme or iconographic element they are best associated with. Some notnames created based on a single artwork, called namepiece. Well known examples include the Master of the Embroidered Foliage (active c. 1480 to c. 1510) so named after his distinctive way of painting grass and trees, the Master of the Life of the Virgin (active c. 1463 to c. 1490) and the Master of the Legend of the Magdalen (active c. 1483 – c. 1527) both named after scenes from the Life of the Virgin attributed to them, the Master of the Prado Adoration of the Magi (active c. 1475 – 1500) named after his most famous panel, and the Vienna Master of Mary of Burgundy (c 1470 – c 1480), named after a manuscript owned by one of his patrons. The Berlin Painter (active c. 490s-c. 460s BCE) was named by Sir John Beazley for a large lidded amphora in the Antikensammlung Berlin, the Berlin Painter's namepiece.In the case of 14th and early 15th-century Netherlandish, French and German painters and illuminators, the problem is particularly acute and stems from a number of factors. Primarily, the practice of signing and dating works is rarely seen in the region until the 1420s, and the inventories of collectors were uninterested in the artist's names. Many of the unidentified late 14th and early 15th-century northern artists were of the first rank, but because they have not been attached to any historical person, have suffered from academic neglect. It is probably a truism to say that, as Susie Nash put it, "much of what cannot be firmly attributed remains less studied". Some art historians believe that this has led to a lack of caution in connecting works with historical persons, and that such connections often hang on thin threads of circumstantial evidence. The identities of a number of well-known artists have been founded on the basis of a single signed, documented or otherwise attributed work, with similar works sharing close style or within a geographical range also attached to that name. Examples include Hugo van der Goes, Robert Campin, Stefan Lochner and Simon Marmion. The Portinari Altarpiece or Portinari Triptych (c. 1475) is an oil on wood triptych painting by the Flemish painter Hugo van der Goes representing the Adoration of the Shepherds. It measures 253 x 304 cm, and is now in the Galleria degli Uffizi in Florence, Italy. Portrait Francesco Giamberti is a c.1485 oil on panel painting by Piero di Cosimo, now in the Rijksmuseum in Amsterdam. The background details show the influence of Hugo van der Goes. Its subject was a legnaioulo or furniture carver who worked for Cosimo the Elder and the Medici and also composed music for them, carving a musical score into the base of one of the pieces of furniture they commissioned from him. He probably also worked for the papacy. He also founded a major Tuscan family of architects and artists who assumed the name Sangallo, possibly after property they owned at the San Gallo gate of Florence - Giuliano da Sangallo and Antonio da Sangallo the Elder were his sons and Antonio da Sangallo the Younger, Bastiano da Sangallo and Francesco da Sangallo were his grandsons. It was Giuliano who commissioned Piero di Cosimo to produce a double portrait of himself and his father, probably using a death mask for the latter. In many parts of Europe, Early Renaissance art was created in parallel with Late Medieval art. The influences upon the development of Renaissance men and women in the early 15th century are those that also affected Philosophy, Literature, Architecture, Theology, Science, Government, and other aspects of society. The following list presents a summary, dealt with more fully in the main articles that are cited above. Classical texts, lost to European scholars for centuries, became available. These included Philosophy, Prose, Poetry, Drama, Science, a thesis on the Arts, and Early Christian Theology. Simultaneously, Europe gained access to advanced mathematics which had its provenance in the works of Islamic scholars. The advent of movable type printing in the 15th century meant that ideas could be disseminated easily, and an increasing number of books were written for a broad public. The establishment of the Medici Bank and the subsequent trade it generated brought unprecedented wealth to a single Italian city, Florence. Cosimo de' Medici set a new standard for patronage of the arts, not associated with the church or monarchy. Humanist philosophy meant that man's relationship with humanity, the universe and with God was no longer the exclusive province of the Church. A revived interest in the Classics brought about the first archaeological study of Roman remains by the architect Brunelleschi and sculptor Donatello. The revival of a style of architecture based on classical precedents inspired a corresponding classicism in painting and sculpture, which manifested itself as early as the 1420s in the paintings of Masaccio and Uccello. The improvement of oil paint and developments in oil-painting technique by Dutch artists such as Robert Campin, Jan van Eyck, Rogier van der Weyden and Hugo van der Goes led to its adoption in Italy from about 1475 and had ultimately lasting effects on painting practices, worldwide. The serendipitous presence within the region of Florence in the early 15th century of certain individuals of artistic genius, most notably Masaccio, Brunelleschi, Ghiberti, Piero della Francesca, Donatello and Michelozzo formed an ethos out of which sprang the great masters of the High Renaissance, as well as supporting and encouraging many lesser artists to achieve work of extraordinary quality. A similar heritage of artistic achievement occurred in Venice through the talented Bellini family, their influential in-law Mantegna, Giorgione, Titian and Tintoretto. The publication of two treatises by Leone Battista Alberti, De Pitura (On Painting), 1435, and De re aedificatoria (Ten Books on Architecture), 1452. Saint Luke Drawing the Virgin is a large oil and tempera on oak panel painting, usually dated between 1435 and 1440, attributed to the Early Netherlandish painter Rogier van der Weyden. Housed in the Museum of Fine Arts, Boston, it shows Luke the Evangelist, patron saint of artists, sketching the Virgin Mary as she nurses the Child Jesus. The figures are positioned in a bourgeois interior which leads out towards a courtyard, river, town and landscape. The enclosed garden, illusionistic carvings of Adam and Eve on the arms of Mary's throne, and attributes of St Luke are amongst the painting's many iconographic symbols. Van der Weyden was strongly influenced by Jan van Eyck, and the painting is very similar to the earlier Madonna of Chancellor Rolin, usually dated to around 1434, with significant differences. The figure's positioning and colourisation are reversed, and Luke takes centre stage; his face is accepted as van der Weyden's self-portrait. Three near contemporary versions are in the Hermitage Museum, Saint Petersburg, the Alte Pinakothek, Munich, and the Groeningemuseum, Bruges. The Boston panel is widely considered the original from underdrawings that are both heavily reworked and absent in other versions. It is in relatively poor condition, having suffered considerable damage, which remains despite extensive restoration and cleaning. The painting's historical significance rests both on the skill behind the design and its merging of earthly and divine realms. By positioning himself in the same space as the Madonna, and showing a painter in the act of portrayal, Van der Weyden brings to the fore the role of artistic creativity in 15th-century society. The panel became widely influential with near copies by the Master of the Legend of Saint Ursula and Hugo van der Goes. The Trinity Altarpiece, also known as the Trinity Altar Panels, is a set of four paintings in oil on wood thought to have been commissioned for the Trinity College Kirk in Edinburgh, Scotland, in the late fifteenth century. The work is attributed to the Flemish artist Hugo van der Goes and probably represents the inner and outer panels of the wings of a triptych. The presumed central panel is lost. The painting in the church was described as a "burd" on 17 May 1516 when John Stewart, Duke of Albany made an offering at the high altar on Trinity Sunday.The work represents a rare example of Scots religious art to have survived the iconoclasm of the Reformation. The panels are part of the British Royal Art Collection and are displayed at the National Gallery of Scotland. The Vienna Diptych or the Fall and Redemption of Man is a religious diptych by the Flemish artist Hugo van der Goes depicting the fall of man on the left panel and the lamentation of Christ on the right panel. Painted in the second half of the 15th century, the diptych is housed in the Austrian Kunsthistorisches Museum, Vienna.The tempting Serpent is depicted as a bipedal salamander-like creature because it was assumed that the serpent could walk before God's curse compelled it to crawl and eat dust. The human-headed Serpent was introduced into art in the late 13th century. Subsequent Renaissance artists generally abandoned the depiction of Serpent as a human-headed creature.The reverse side of the left panel has an image of St. Genevieve painted on it. The reverse side of the right panel bears traces of a coat of arms, consisting of a shield with a black eagle and two supporters, of which only the feet survived. The coat of arms was painted in the 17th century and indicates possible Habsburg ownership of the diptych.